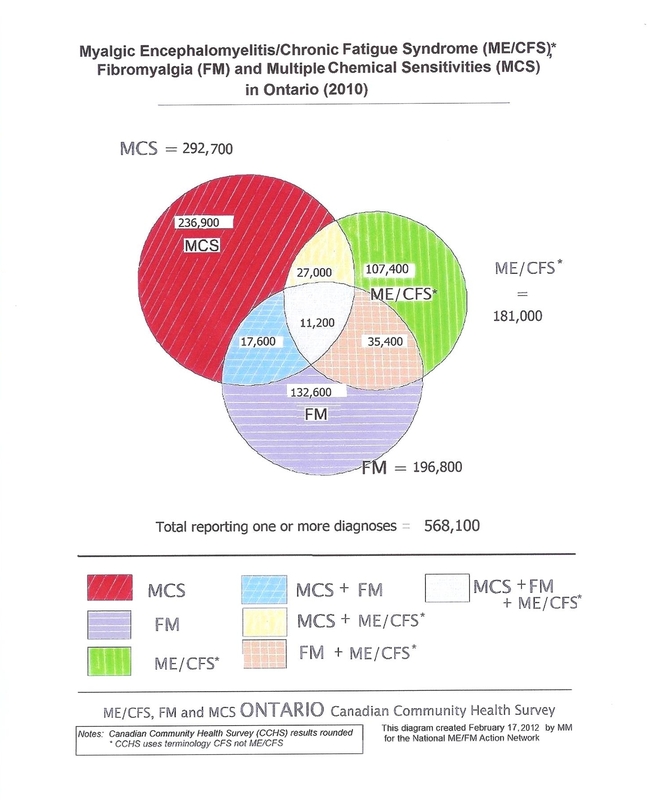 Included here are links and images with Canadian stats for MCS/ES, FM, and ME/CFS, and some US and International stats for MCS. Across four countries (United States, Australia, United Kingdom, Sweden), 19.9% of the general population report chemical sensitivity, 7.4% report medically diagnosed MCS, and 32.2% report fragrance sensitivity (i.e., health problems from fragranced consumer products). J Occup Environ Med. 2018 Jan 11. doi: 10.1097/JOM.0000000000001272. To assess the prevalence of multiple chemical sensitivities (MCS), its co-occurrence with asthma and fragrance sensitivity, and effects from exposure to fragranced consumer products. A nationally representative cross-sectional population-based sample of adult Americans (n = 1,137) was surveyed in June 2016. 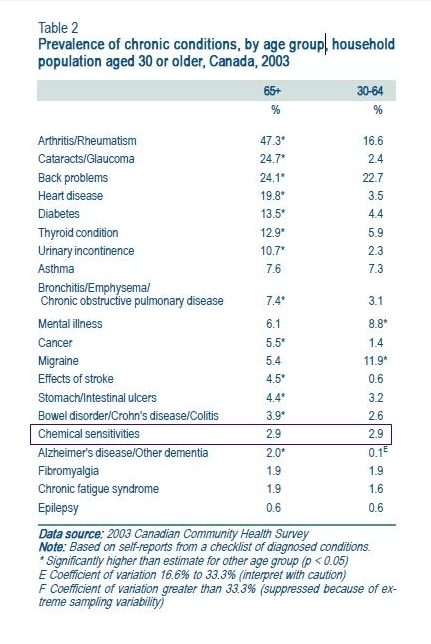 Among the population, 12.8% report medically diagnosed MCS and 25.9% report chemical sensitivity. Of those with MCS, 86.2% experience health problems, such as migraine headaches, when exposed to fragranced consumer products; 71.0% are asthmatic; 70.3% cannot access places that use fragranced products such as air fresheners; and 60.7% lost workdays or a job in the past year due to fragranced products in the workplace. Prevalence of diagnosed MCS has increased over 300%, and self-reported chemical sensitivity over 200%, in the past decade. Reducing exposure to fragranced products could help reduce adverse health and societal effects. “What is striking about MCS is its prevalence. 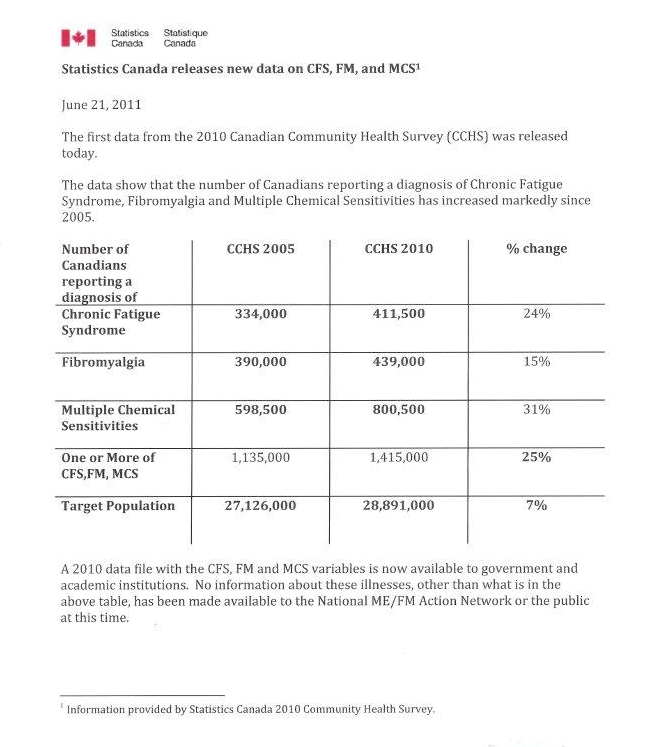 The Canadian Community Health Survey shows prevalence figures of 599,000 in 2005, 800,000 in 2010 and 722,000 in 2014. We have the advantage of seeing prevalence figure for 2015 (940,000) and for 2016 (just over 1,000,000 people). Our first observation is about the 2014 prevalence figure. While there are concerns about comparing figures from before 2015 with the figures for 2015 and later due to changes in the survey, the 2014 figure is out of line in the time series. That suggests that there was a problem with the 2014 sample for MCS (which can happen by chance). We were already unsure how to interpret the data, and this finding suggests that it is advisable to be cautious about drawing conclusions about MCS using the 2014 data. Our second observation concerns the prevalence levels in general. MCS is a medical condition that does not have an ICD (International Classification of Diseases) code, meaning that it is not recognized by the World Health Organization. It does not have diagnostic and billing codes in any jurisdiction in Canada. 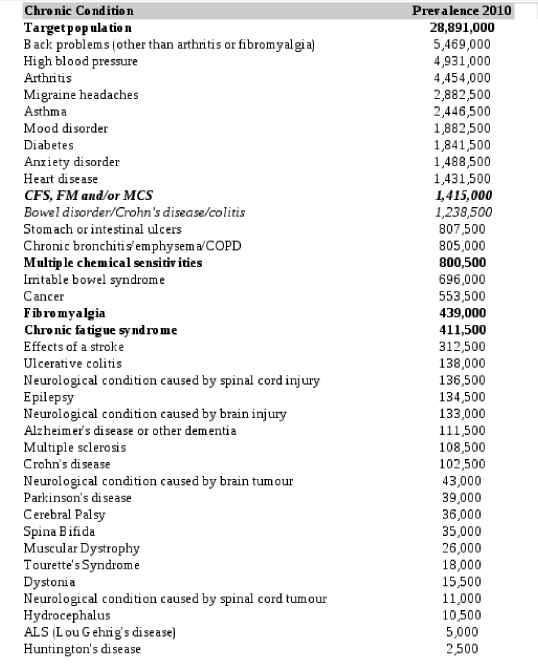 It has received less than $40k in CIHR funding since 1999. And yet the survey consistently finds that hundreds of thousands of people report that they have been diagnosed with MCS by a health professional. Receiving a proper diagnosis is still very difficult for most people who are affected, as the majority of doctors know very little if anything about these conditions. 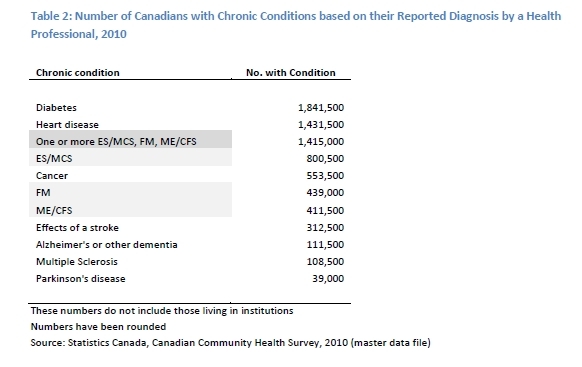 Additionally, some people who have them (and know they have them) don’t bother to seek official diagnosis, knowing how difficult it is due to the current lack of medical understanding, while others are too severely ill to access the few health care professionals who could officially diagnose them, even if they know where to go. The statistical surveys usually ask if people have been doctor diagnosed, and most do not include those who do not have an official diagnosis. This means that the number of people affected is actually much higher than reported. Note that these “numbers” (which represent real people) do not include children. 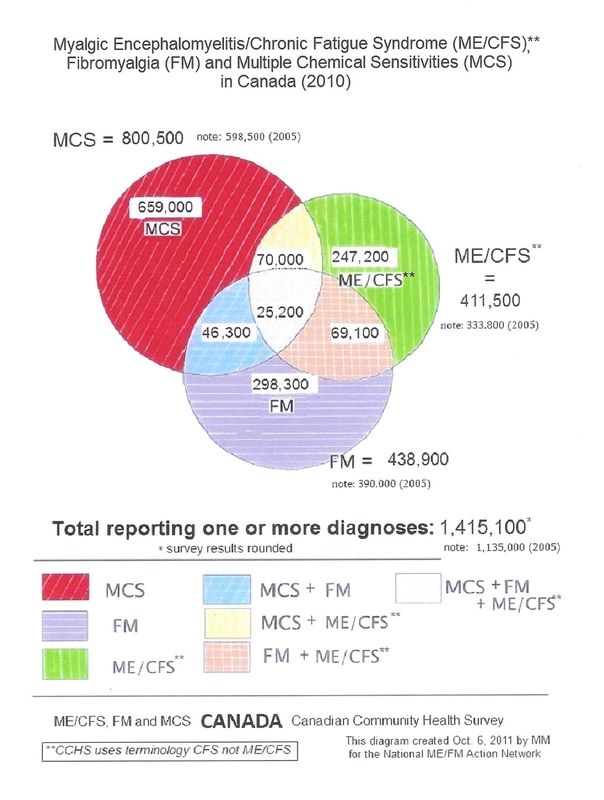 There doesn’t seem to be any official gathering of statistics for the number of children with these conditions, any evidence about if children are actually and correctly diagnosed, nor any ongoing research about how many children diagnosed with Autism might actually have MCS/ES. 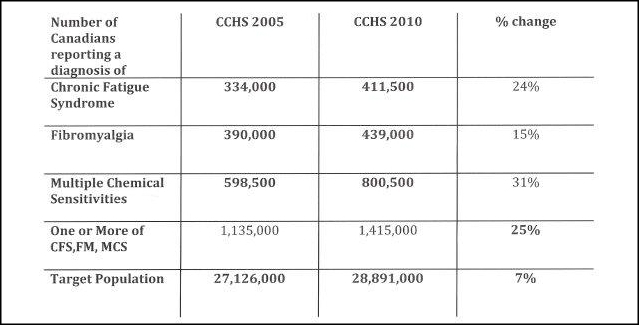 It is said that these disabling conditions will again be included in the 2014 CCHS report, so maybe by late 2015 or in 2016 we will have access to the new numbers to see how many more people are suffering. What follows are the numbers from 2010 and earlier. Arch Environ Health. 1996 Jul-Aug;51(4):275-82. Prevalence and nature of allergy and chemical sensitivity in a general population. Meggs WJ, Dunn KA, Bloch RM, Goodman PE, Davidoff AL. The objectives of this study were (a) to determine the self-reported prevalence of allergy and chemical sensitivity in a rural population of eastern North Carolina, (b) to determine the type and frequency of symptoms for each condition, and (c) to determine the demographic groups affected. A random general telephone survey was conducted during the period May 14, 1993, to September 10, 1993, and questions about allergy and chemical sensitivity were asked. Of the 1 446 households contacted, 1 027 (71%) individuals agreed to participate. Allergies were reported by 365 (35%) individuals. Thirty percent of allergic individuals reported that symptoms occurred once or more each week, whereas 61% reported that symptoms occurred, at most, once each month. Allergic symptoms that occurred daily were reported by 5.3% of the total population. Chemical sensitivity was reported by 336 (33%) individuals. Thirty-five per cent of chemically sensitive individuals reported symptoms at least once each week, whereas 53% reported that symptoms occurred once (or less) each month. Symptoms of chemical sensitivity that occurred daily were reported by 3.9% of the total population. Both allergy and chemical sensitivity were distributed widely across age, income, race, and educational groups. Simultaneous allergy and chemical sensitivity were reported by 16.9% of the population, allergy without chemical sensitivity by 16.0%, chemical sensitivity without allergy by 18.2%, and neither condition by 48.9%. If the prevalence of sensitivity to chemical irritants is, in fact, equivalent to that of allergy, as was found in this study, then support for the scientific investigation of chemical sensitivity is justified. Arch Environ Health. 2004 Jun;59(6):300-5. A national population study of the prevalence of multiple chemical sensitivity. The authors conducted a telephone survey of 1054 randomly selected individuals within the continental United States to determine the prevalence of chemical hypersensitivity and the medical diagnosis of multiple chemical sensitivity (MCS) in the American population. The etiology and symptomatology of MCS also were investigated. Results produced a 95% confidence level and a +/-3% margin of error. The authors found that 11.2% of Americans reported an unusual hypersensitivity to common chemical products such as perfume, fresh paint, pesticides, and other petrochemical-based substances, and 2.5% reported they had been medically diagnosed with MCS. Additionally, 31.1% of those sampled reported adverse reactions to fragranced products, and 17.6% experienced breathing difficulties and other health problems when exposed to air fresheners. Although chemical hypersensitivity was more common in women, it affected individuals in all demographic groups studied. It’s time to do better and get serious about practicing precaution and prevention, as well as providing proper health care and other services for the people who are affected!